Abu ʿAmr Uways al-Qaranī (Arabic: أبو عَمرو أُوَيس القَرَني) (b. 30 BH/592 - d. 37 AH/657), was one of the noblemen of Tabi'un and is known as the example of asceticism and piety. After the demise of the Holy Prophet (s) he was one of the close companions of Imam 'Ali (a). He was martyred in the Battle of Siffin against Mu'awiya. His shrine in Syria became mostly destructed by Salafi groups in 1434/2013. Abu 'Amr Uways b. 'Amir al-Qarani al-Muradi al-Yamani, was from "Qaran", one of the clans of the Banu Murad tribe. Uways was living in Yemen during the lifetime of the Holy Prophet (s) but he could never meet him. He was a camel herder, taking care of his old, blind mother. Once, he wanted to go to Medina to visit the Holy Prophet (s). His mother allowed him to do so on the condition that he will return home before the day is over. He went to Medina, but when he reached Medina, the Holy Prophet (s) had left the city for a period, so Uways wasn't able to meet him, and left Medina for Yemen, because of his promise to his mother. When the Holy Prophet (s) came back to Medina heasked, "Whose light am I seeing in this house? ", he was answered, "a camel herder named Uways, came and left soon". The Holy Prophet (s) said, "He left this light in our house as a present and left." According to not-so-reliable narrations, Uways came to Medina with a group from Yemen or Kufa and 'Umar b. al-Khattab recognized him with the signs the Holy Prophet (s) had given him. The differences about the details of the life of Uways is to the extent that even in the first centuries of Islam there were doubts about his life. After all, it is said that he had narrated from Imam 'Ali (a) and 'Umar b. al-Khattab, and some of the hadith scholars of the 1st/7th century -mostly from Kufa- had narrated from him. About his worship it is said, "Some nights he said, 'tonight is for Ruku'', and spent the night in Ruku'. The other night he said, 'tonight is for Sujud', and spent the night in Sujud. Once he was asked, 'why you bother yourself this much?' He answered, 'I wish that there was only one night from the beginning of the time to the eternity, and I spent all of it in one Sajda.'" Uways is one of the first examples of asceticism and piety among Muslims. Later, Sufis gave him a great position in their books, as his name is among the eight ascetics of Tabi'un. All of who had seen Uways, described him in poverty and anonymity, and it is said that he did not have appropriate clothes, and this was one of the reasons of his seclusion. In another report it is said that he wore a rough woolen cloth. Also some aphorisms about the unreliability of the world and the proximity of the death is reported form him. There are some extended mentions of Uways in the literature of Sufis. The Holy Prophet (s) says, "I smell the scent of the Paradise from Yemen (because of the presence of Uways there)." According to a report, Uways was aware of the mood of the Holy Prophet (s), although he was far from him. Imam 'Ali (a) narrated from the Holy Prophet (s) that he said about Uways, "He is one of the Hizb (party) of Allah. His death will be martyrdom in the way of religion, and a lot of people will be freed from the Hell with his intercession." According to 'Attar Nisaburi in Tadhkirat al-awliya', the Holy Prophet (s) said to his companions: 'Say my Salam to Uways and give him my dress and ask him to pray for the Umma', after the demise of the Holy Prophet (s), 'Umar saw him in 'Arafat and fulfilled the wish of the Holy Prophet (s). There's much possibility that this story and other stories reported in the books of Sufis is forged for making virtues for him, because they do not have proper sources and Sufis consider him as one of their Shaykhs and there is weird stories about him in these books. In the opinion of Shi'a, Uways has a special status as one of the companions of Imam 'Ali (a), al-Shaykh al-Mufid has named him as one of the Shi'as who pledged allegiance to Imam 'Ali (a). Uways is considered as one of the insane wises. He is noted very much by Sufis because of His seclusion and his intuitions (Mukashafa) although he did not do very much mystical practices and was not old when he reached this rank. There is a cult in Sufism named Uwaysi. Sayyid Haydar Amuli one of the mysticism scholars, considers Uways among the noble companions of the Holy Prophet (s) like Salman, Abu Dhar, 'Ammar, and the people of Suffa (Ashab al-Suffa). He differentiates them from other Sufi Shaykhs, and considers them as the students of the Imams. It is reported that people treated Uways like an insane and sometimes children stoned him, his only compliant was, "my feet are thin, throw smaller stones so my feet do not bleed and I could pray, as I care the prayer not the feet." 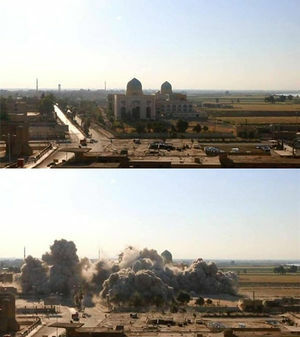 The rocket attack to the shrine of Uways al-Qarani and 'Ammar b. Yasir, in 2013 by Salafi groups in Syria. Uways spent last years of his life in Kufa. He was martyred in the Battle of Siffin in 37/657, while he was 67. There are some places claimed to be his grave. As most of the reports indicate, he was one of martyrs in the Battle of Siffin, so the grave in al-Raqqa, Syria; to the left of the grave of 'Ammar b. Yasir (also one of the martyrs of the Battle of Siffin) is more reliable as being his grave. There is also a shrine for these two companions of the Holy Prophet (s) and Imam 'Ali (a). On Ramadan 21, 1434/2013, Salafi groups active in Syria who had gained the control of al-Raqqah province, attacked the shrine of 'Ammar b. Yasir and Uways al-Qarani with mortar and rocket and destructed most of it. Majlisi, Muhammad Baqir al-. Bihar al-anwar. This page was last edited on 15 August 2018, at 15:10.